As a non-surgical procedure that requires no down-time, receiving Botox injections in the facial area for the purpose of tightening skin and eliminating the appearance of wrinkles has gained wide popularity. Because of its success, physicians have been searching for even more uses for the product. Many new procedures using Botox are “off-label,” meaning that they are not what the product was initially intended for, but that doesn’t mean they are unsafe or ineffective. One example of an effective, off-label use for the Botox cosmetic is for the purpose of improving neck sagging or neck wrinkles. There are many reasons for the formation of wrinkles and sagging of the skin. These reasons may include excess exposure to the sun, genetic predisposition, and/or the loss of collagen and elasticity within the skin, which is a normal effect of aging. Specifically in the neck area, as we age the platysma neck muscle can enlarge or become more lax. This can lead to the formation of vertical ridges or horizontal bands, which will gradually become more pronounced when the neck muscle is contracted. 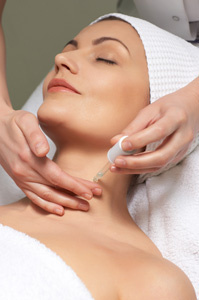 Botox injections may be used as a means of diminishing unsightly and unwanted wrinkles on the neck. Botox can treat the vertical bands or horizontal lines around the neck that may have formed from the contraction of the platysma muscle. Once the medicine has been injected into the neck muscle area, Botox begins to relax the platysma muscle, diminishing the appearance of these lines. During the procedure, it is best for the patient to contract his or her neck muscles so that the Botox can be correctly injected along the ridges of the muscles. It is important that the physician performing the Botox injections is properly trained in how, how much of it, and where to inject because a mistake in any of these areas can affect the patient’s ability to swallow. More than one treatment may be necessary to achieve the look the patient is looking for, but about 2 weeks should be given between treatment times. Botox Houston consists of professional medical aestheticians that are specially trained in a wide variety of injection techniques and are knowledgeable in any protocols associated with the Botox cosmetic. We can provide you with a successful treatment experience, consisting of little to no discomfort, and no need for down-time. Smoother and tighter skin can start to be seen in as little as 1-3 days after the procedure was performed, and patients are generally very satisfied with the results.